Welcome, %1$s. Please login or register. This is an amazing build, really fantastic work so far!!! Best wishes for a speedy recovery. You've done more fantastic work with one good arm than I've done with two. Bravo. Hope the impending procedure and recovery goes smoothly. Thanks for the comments folks. It's beyond frustrating/annoying trying to do just about everything one handed and I think I have invented some new swear words! 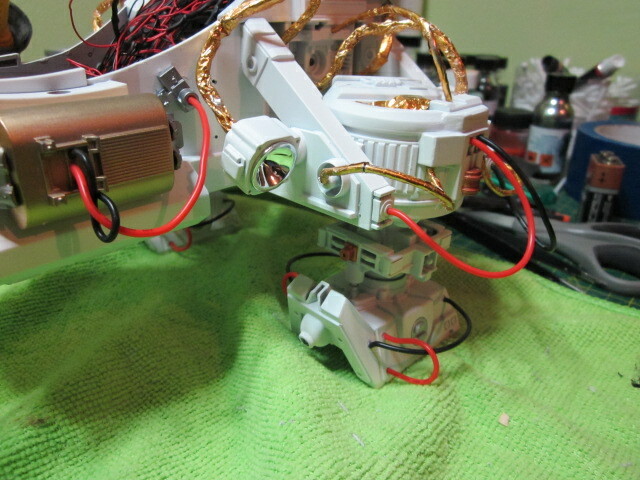 Took a little experimenting to get the look I wanted but basically once the led was wired up I just needed to see how much of the wiring would be left on the outside of the kit once I threaded one end through pre-drilled holes to be joined up on the inside.The length on the outside was covered in a cut length of heatshrink. 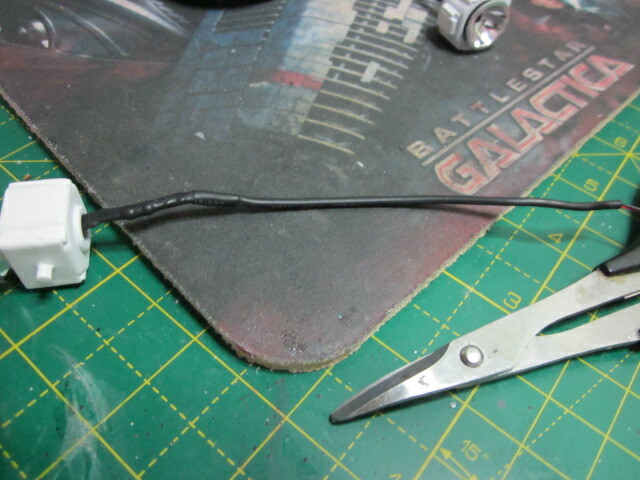 That piece alone was pretty inflexible so I wrapped some magnet wire along the length and that enabled me to bend the heatshrink/led cable to just about any angle without it wanting to straighten out again. It wasn't perfect but more than good enough for my idea. 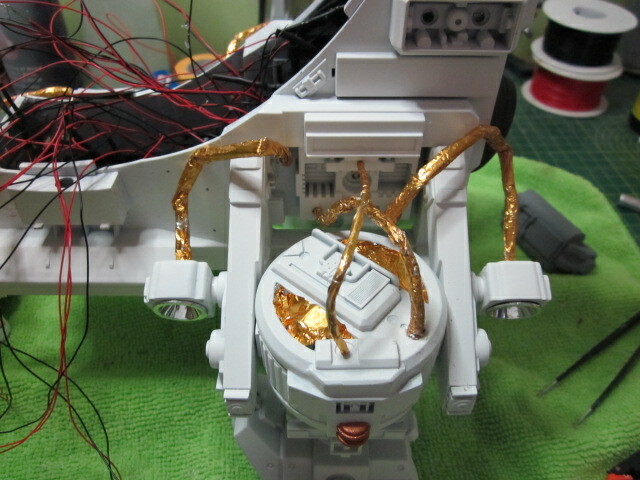 Gold foil was then wrapped around the led heatshrink to cover up the wire. The foil was liberally coated with canopy glue as I wrapped it around the cable and it usually needed two pieces to completely cover it up until I was left with this. 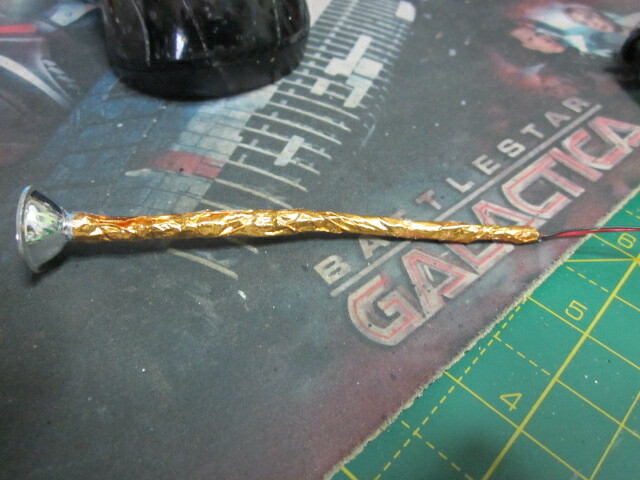 The foil was a bit baggy in places so I twisted it in the direction of the edge every few minutes as the glue cured until the cable was nice and fairly taught. I had noted in all those space videos I have been watching that the gold foil (or whatever it is that is used) is never flat or straight and is always slightly wrinkled so that was the look I got. 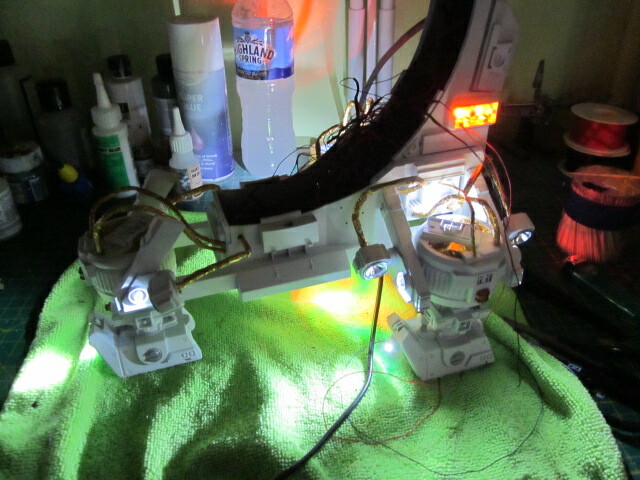 Once that was done and all the cables were dry I spent a happy hour attaching lights and threading wires. Actually it took the better part of four hours with one arm/hand but I wasn't up to much anyway. The above mess has since been tidied up which was fun. Now I thought I would have a wee look at what the kit will eventually look like once it's done. 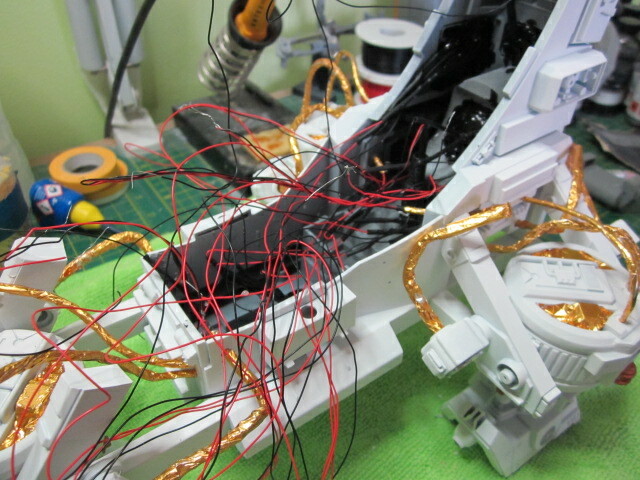 I still have the upper hull seam lines to attend to which will be fun as I so love seam work. 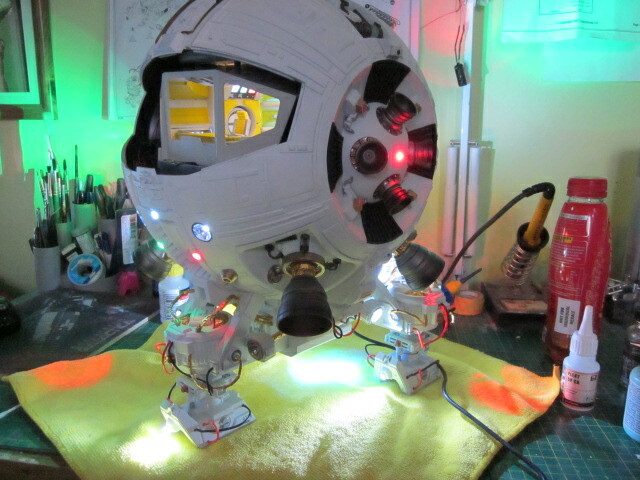 We're getting there with this one and this morning I got the kit wired up as it will be when complete to check out the wiring and to make sure it all worked as it should. This is the first time the lighting has been checked out as one whole setup and I'm still here. As always I hope you like what you see. Just spotted one of the forward floodlights that I hadn't attached to the main wiring loom wasn't on so that's been sorted now.! Just a quick wee update. The sled/undercarriage/landing gear thingamabob is pretty well done and dusted with just some pipe pieces to be added and the mesh grills for the spotlights when I get around to them sometime today. 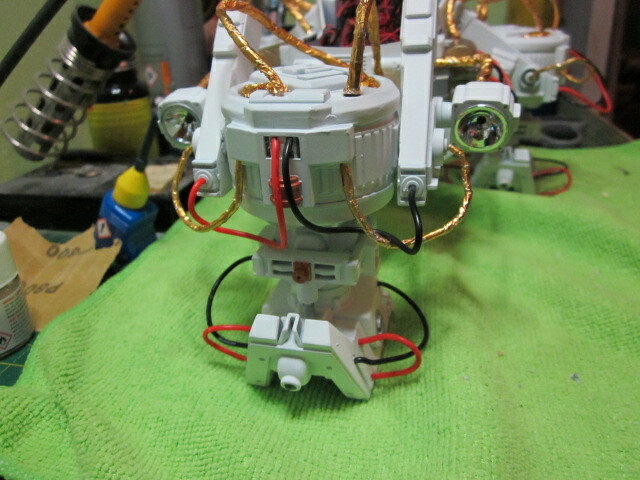 I added some additional cabling as I thought this thing would be hydraulically powered in some way and especially around the landing legs and feet. 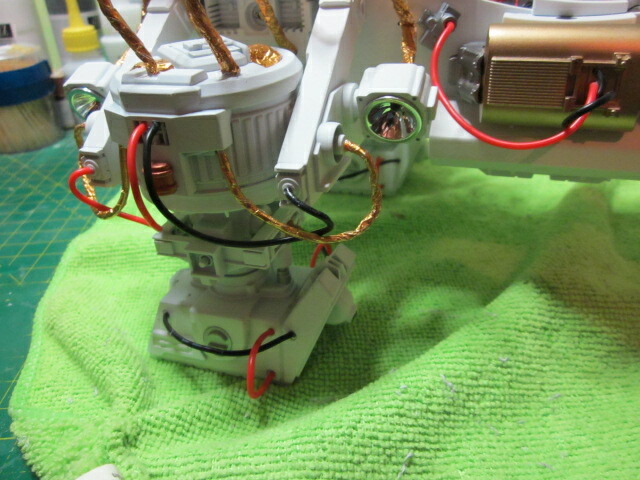 The model has more than enough nooks and crannies where such cabling can be added without going overboard (to me anyway) but I did sit down and look at the part for a bit first to try and figure out where any such hydraulic lines could/would be placed. Going to attend too the seams on "The Ball" today once I get my act together (it's Mother's Day here in the UK). I wasn't going to use the kit supplied figures but both Eleanor and my mum thought it would be a waste once they saw what the kit will look like on that video I shot. 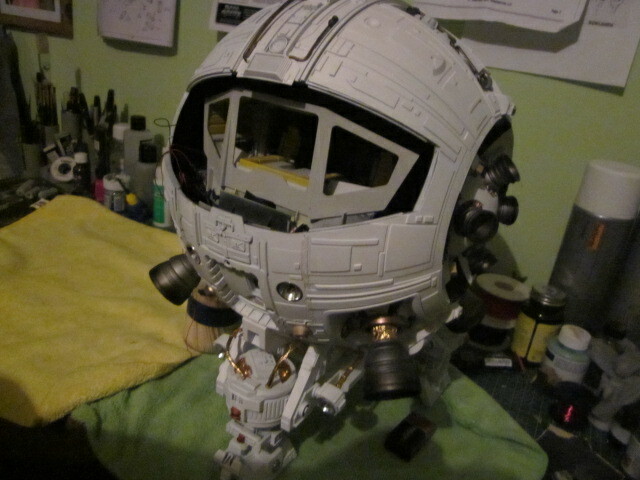 So - the figures will be posted to a mate who is a superb figure painter and they'll be added when they arrive so all I'll have to do then is add one into the cockpit then I can add the main window section and the other will be on the base. The base will just be a plain circular base stained somehow. I reckon I'll have this kit pretty well completed (bar the window frame and figures) in the next day once I paint up some of the panels on the main hull and apply the decals. Then at last I will start a kit which no-one has seen before and that will be the 1/350 USS Enterprise refit so I hope you look forward to that build. Fly! Fight! Win! And call me when you're back. 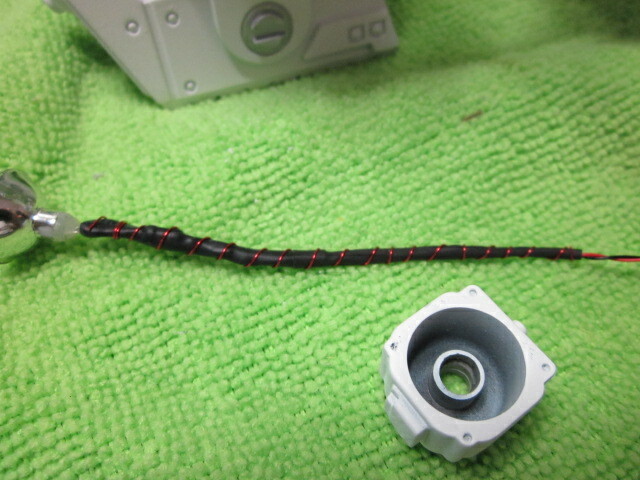 The greebly cables look very well done. What did you use for the gold looking foil? That must have taken some time. Then at last I will start a kit which no-one has seen before and that will be the 1/350 USS Enterprise refit so I hope you look forward to that build. I KNOW I will be watching THAT build! Is this one to replace the other that your cat knocked off? Good luck and keep going! "To be honest with you, Picard, a significant number of my crew members have expressed a desire to return even knowing the odds. Some because they can't bear to live without their loved ones, some because they don't like the idea of slipping out in the middle of a fight." The gold foil I got from Ebay and it's used in baking and to wrap up sweets. It's very thin but suprisingly tough and for 4gbp you get 100 sheets so it's a bargain. The kit is in one piece at last. 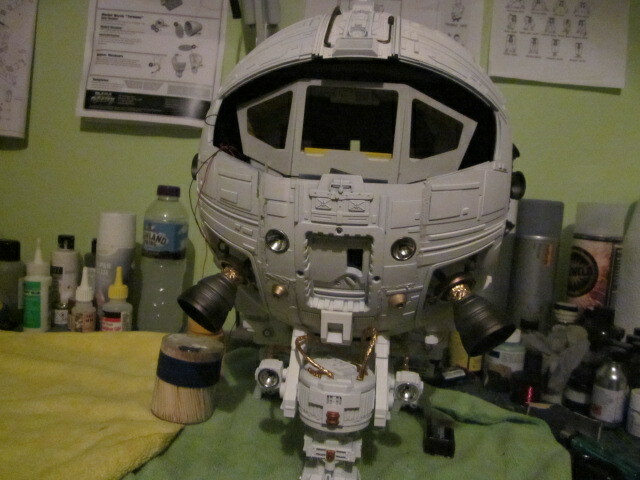 That was fiddly (the olde' one arm syndrome strikes again) and just some touch up work around the puttied seam and then I can get the detail painting by picking out some of the panels and then the decals and we're sorted on this one. This kit is "HEAVY" and if the bathroom scales weren't knackered I would certainly weigh it out of curiosity. We're not quite at the finish line yet but close enough at this stage.